Hello! It's another exciting challenge over Virginia's View Challenge! This month is a Fun one. We are talking about "Embellishments". ~ a decorative detail or feature added to something to make it more attractive. ~a detail, especially one that is not true, added to a statement or story to make it more interesting or entertaining. ~ the action of adding details or features. Embellishments wanted: ribbons, buttons, trim, lace, sequins, gemstones, twines, pearls.... Decorate, decorate and decorate: we want to see embellishments as the STAR of your cards. You can use any types of embellishments on your project. Even better, Do-It-Yourself embellishments are strongly encouraged! Please get as creative as you possibly can. Do not be shy on using recycling materials, too. In fact, brownie points will be added if you can recycle your stash! 1. today's post is the only post for the entire month of August. 2. the Spotlight feature (for Top 10 favorites and HM) will be posted in early September. 3. we have a few talented guest designers who are sharing their talent with us today. AND they are the acting judges for this month's challenge! Dr. John, Virginia (me) and Stephanie are taking a month off from judging. Your "destiny" is left in the good hands of our guest designers! 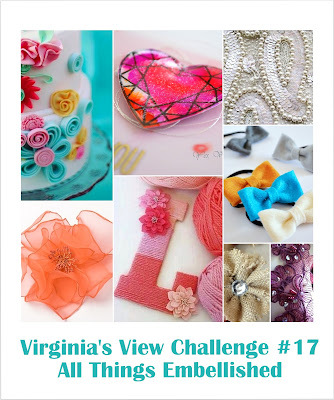 My take on this challenge: Embellishments are little things. They can be really small, but they can have a huge impact. For my project, I used some random circles (leftover from the word die Smile). 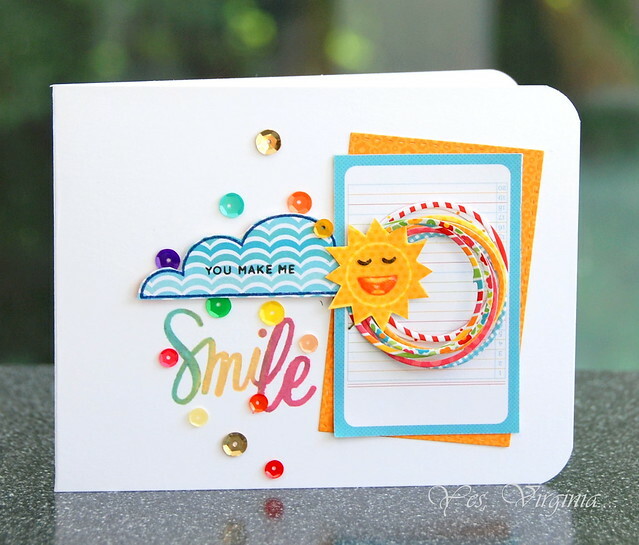 I grouped a few of them, added the stamped sun and clouds, and used colorful sequins to emphasize the rainbow colors. It's a SMILEY card. I sure hope that you get your thinking cap on and start creating with embellishments in mind! The guest designers and I can't wait to check out your creations. and my monthly Stamp Study.